Artist/maker unknown, Northern Italian or French. Commissioned by Magdalena Sibylla of Brandenburg, 1587 - 1659, for her husband, Duke Johann Georg I of Saxony, 1585 - 1656 (ruled as prince elector 1611 - 1656). 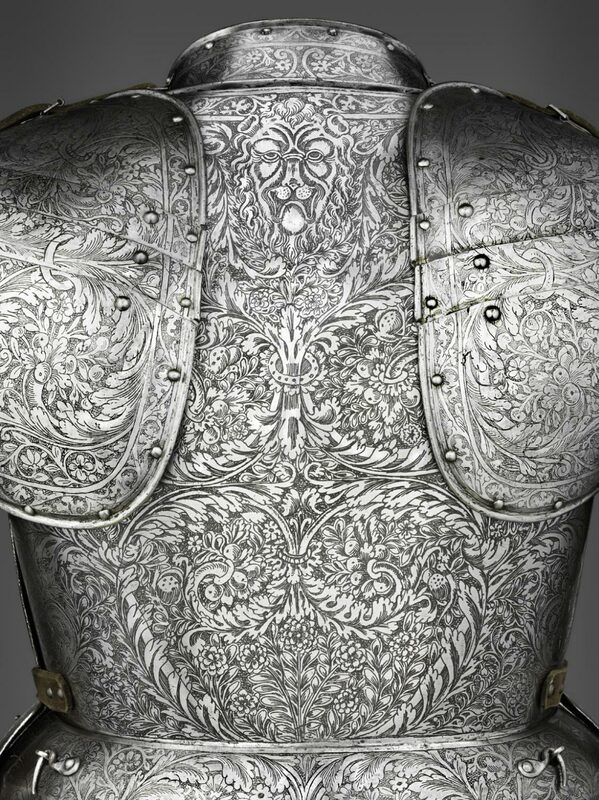 In the court of Saxony, influential women sometimes commissioned armor for use by men. 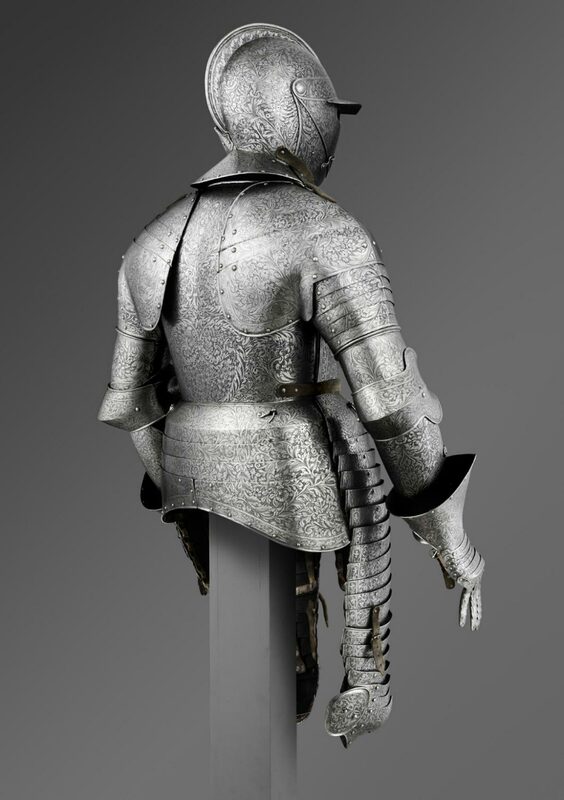 This armor belonged to a set of seven similar armors presented in 1612 by Magdalena Sibylla (1587-1659), margravine of Brandenburg, as a Christmas gift to her husband, Prince Elector Johann Georg I of Saxony (ruled 1611 to 1656). The set, intended for the personal use of the elector and his guests during tournaments contested on foot, was worn on July 4, 1613, to celebrate the baptism of the electoral heir, Johann Georg (1613-1680, ruled 1656 to 1680). 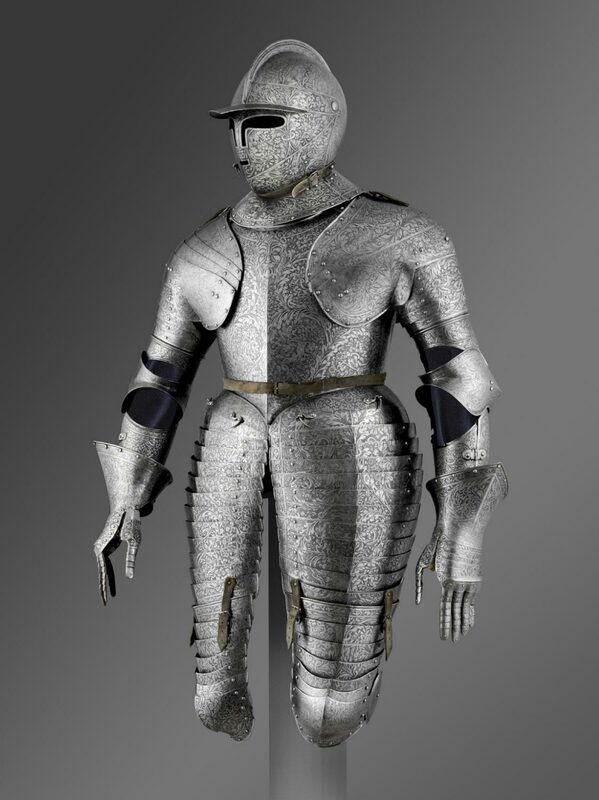 The other six suits of armor, including the elector's own, are preserved in the Kunstsammlungen Dresden, Germany. 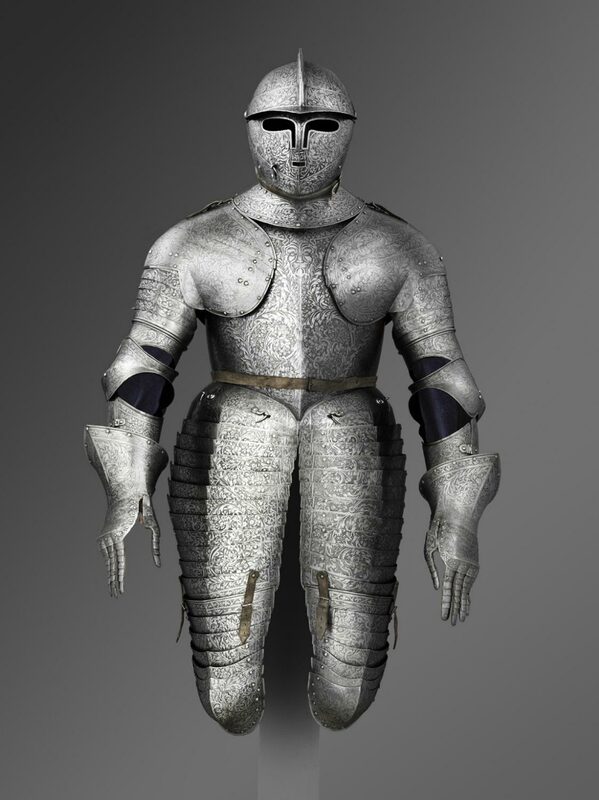 This three-quarter-length armor was designed to be worn in tournament combat fought on foot. 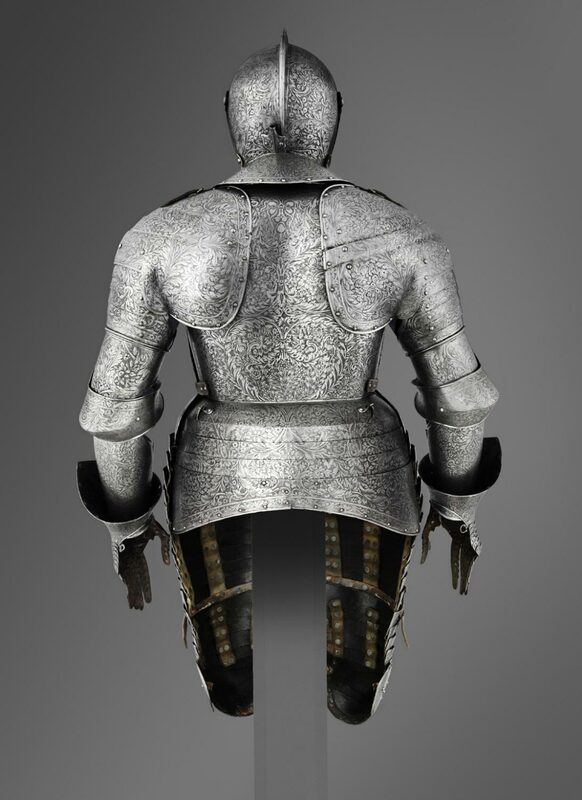 In 1612, this and six similar armors were given as a Christmas present by Magdalena Sibylla to her husband, Prince Elector Johann Georg I of Saxony. 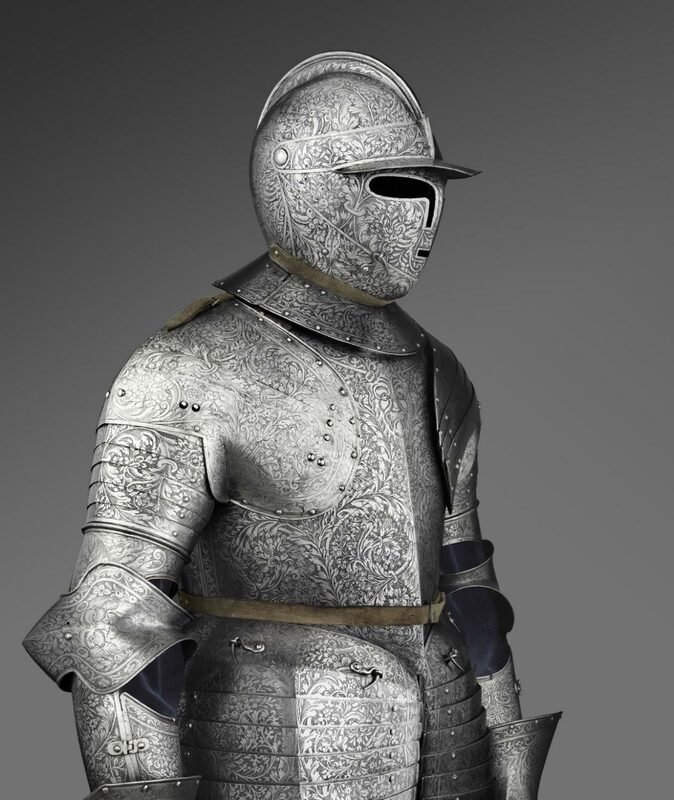 The armors were intended for the personal use of the elector and his guests. In July 1613 they were worn in a tournament celebrating the baptism of his son and heir, the future Johann Georg II. 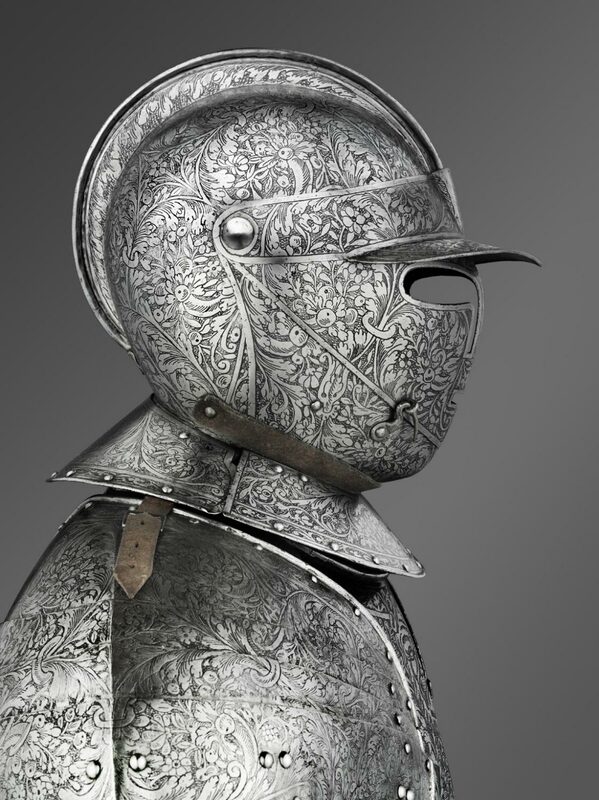 The protection afforded by the armor is apparent especially in the form of the helmet. 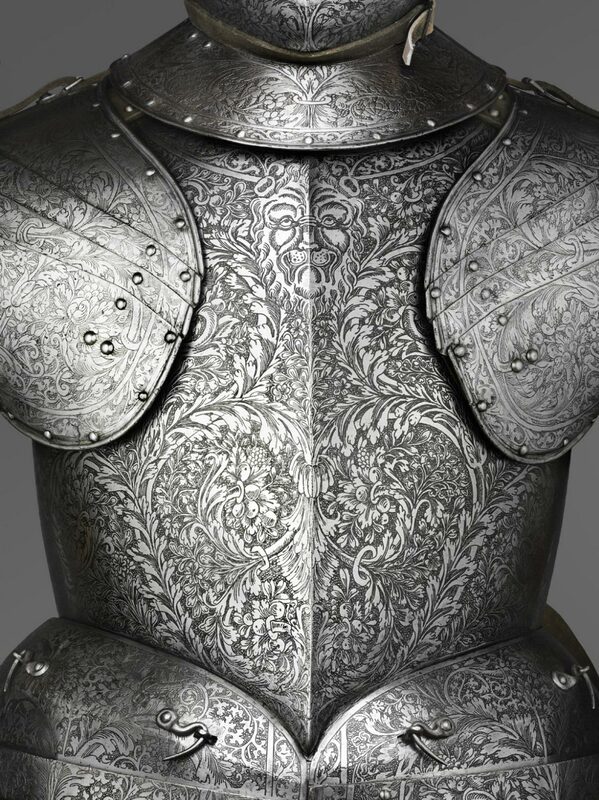 However, the function of the suit is disguised by the decoration in which an exuberant pattern of leaves, called rinceau, completely covers the metal surface, even dominating the heads of the heraldic lions of Saxony, whose rulers were among Europe's greatest admirers of armor. Much of their collection, including the other suits from this set, remains in the Kunstsammlungen, Dresden. Dean Walker, from Philadelphia Museum of Art: Handbook of the Collections (1995), p. 132.